Jean Addington completed her PhD at the University of Calgary, Alberta. She is currently Director of the PRIME Clinic and Director of Psychosocial Treatments in the First Episode Psychosis Program at the Centre for Addiction and Mental Health in Toronto, Canada. She is also an Associate Professor in the Department of Psychiatry, University of Toronto. The Toronto PRIME Clinic is a research-based clinic for individuals who have an ‘at risk mental state’. Her clinical and research interests lie in the understanding and management of this ‘at risk mental state’ and of early psychosis. She has published widely in this area: including psychosocial interventions, cognition, social functioning and substance use in early psychosis and the development of early intervention services. Her current work includes the development of risk assessment models for the conversion to psychosis and cognitive behaviour therapy in the ultra high risk period. Shona M. Francey is a clinical psychologist with 20 years’ experience in public mental health. She began working in the field of early intervention for psychosis when the Early Psychosis Prevention and Intervention Centre (EPPIC) was first established in 1992 in Melbourne, Australia.Within the EPPIC programme she worked as a case manager, COPE therapist and Group Programme leader. COPE is a cognitively oriented psychotherapy that was developed at EPPIC to promote recovery from first episode psychosis. Shona has also been involved in education and training about early psychosis, and the establishment of the PACE Clinic for young people thought to be at risk of developing psychosis. At PACE she has contributed to the development and evaluation of psychological therapy for this at risk group. She completed her PhD examining neurocognitive indicators of risk for psychosis in the PACE population and is currently the Clinical Coordinator of the PACE Clinic. 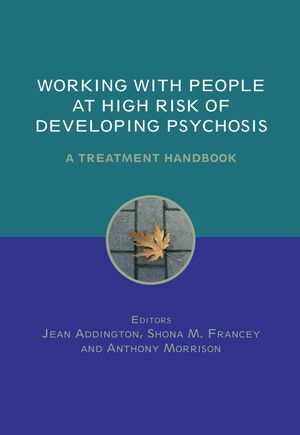 Anthony P. Morrison is a Reader in Clinical Psychology at the University of Manchester and is also a Consultant Clinical Psychologist in a specialist programme of care for people with early psychosis in Salford and Trafford. He has published a number of articles on trauma and psychosis, cognitive therapy for psychosis and experimental studies of cognitive processes in psychosis, and has been involved in a number of treatment trials for cognitive therapy for early psychosis and the prevention of psychosis. He has also published several books on the topic of psychological approaches to the understanding and treatment of psychosis. Unkind observers have suggested his interest in both trauma and losing touch with reality stem from his support of Manchester City Football Club.